Be the first to share your favorite memory, photo or story of Aaro "Nic". This memorial page is dedicated for family, friends and future generations to celebrate the life of their loved one. NICANDER, Aaro Oscar "Nic" - Age 69, of Flint, died Thursday March 21, 2019. Services will be held 3PM Saturday April 6 at Sharp Funeral Home and Cremation Center, 6063 Fenton Road, Flint. Pastor Mark Cox officiating. In lieu of flowers those desiring may make contributions to the American Lung Association. Aaro was born May 6, 1949 in Tawas City, the son of the late Aaro Arthur and Marion (Spencer) Nicander. 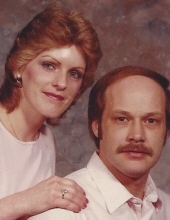 He married Sally Sulzman on December 28, 1983 in Flint. Nic enjoyed yard work, watching football and basketball. He liked going to the casino and especially spending time with his grandchildren. Mr. Nicander retired from the G. M. Buick plant with 36 years of service. Surviving are: wife of 35 years Sally Nicander of Flint; daughters, Ruth Weir of Flint, Alyssa Sulzmann of Flint; grandchildren, twins, Prentiss and Luke Wier, Freya Parks, Nova Thomason; brother, Arthur Nicander of Tawas; sister, Sharon Young of AZ; brother, John Nicander (Georgia) of Flint; and many nieces and nephews. He was also preceded in death by his sister, Vivian Cleary; and brother, Gene Nicander. Online condolences may be shared at www.sharpfuneralhomes.com. To send flowers or a remembrance gift to the family of Aaro "Nic" Oscar Nicander, please visit our Tribute Store. "Email Address" would like to share the life celebration of Aaro "Nic" Oscar Nicander. Click on the "link" to go to share a favorite memory or leave a condolence message for the family.